The NYC personal injury lawyers at Gair, Gair, Conason, Rubinowitz, Bloom, Hershenhorn, Steigman & Mackauf know that legal malpractice cases related to personal injury are more complex and involved than they may initially appear. 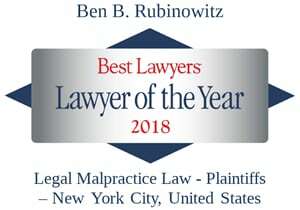 Our attorneys are widely regarded as experts by the legal community in many different areas of personal injury law— medical malpractice, product liability and automobile accident cases to name a few—and this expertise makes us particularly well suited to evaluate whether you were adequately represented by your attorney and to determine whether there is a valid case against an attorney or law firm. Please not that our firm only handles legal malpractice cases related to personal injury. There are aspects of attorney malpractice claims that are distinct from other types of professional liability. Legal malpractice occurs only when an attorney makes a mistake that causes measurable damage to a person, which is usually but not always the attorney’s client. Not all mistakes by lawyers cause damage. Also, as long as the attorney’s judgment was based on an evaluation of the facts and law available to them, lawyers generally are not liable for errors in their professional judgment. For example, matters of legal strategy will not subject an attorney to legal malpractice liability as long as the lawyer's decision is a reasonable one. Otherwise, the decision could be considered legal malpractice. Scrutinizing the underlying matter that the attorney was hired for is paramount to evaluating a legal malpractice case. This is where GGCRBHS&M’s legal malpractice attorneys’ acumen is invaluable. We immerse ourselves in the facts of the underlying matter and develop the critical understanding necessary to handle each case. Recently, the firm was able to recover a $4,500,000 settlement in a legal malpractice case involving a woman whose lawyer failed to file the proper paperwork with the court when she had a claim against her doctor for failing to properly treat her brain tumor. In addition, it successfully bought a legal malpractice case against a law firm which resulted in a $2,250,000 settlement for a man who hired a law firm to represent him in a medical malpractice lawsuit against his doctor seeking compensation for the loss of a kidney. As a result of that law firm's negligence, the medical malpractice case was dismissed. The lawyers at Gair, Gair, Conason, Rubinowitz, Bloom, Hershenhorn, Steigman & Mackauf have more than 90 years of experience representing clients who have suffered financial loss as a result of negligent legal representation. If you feel that your attorney made a mistake when representing you, please contact us to discuss your case.